Non-officially flower season starts about now. Clanwilliam is pretty much in the middle of the area, the southern reach of which goes right down the West Coast towards Darling and Melkbosstrand, and northwards towards Springbok in Namaqualand. 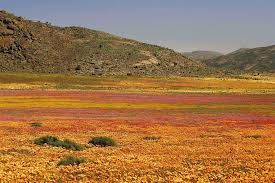 If there has been enough rain during the earlier months of the year, a warm day will see flowers come out by mid-July, as indeed they are appearing, in Namaqualand at the moment, and in small patches around Clanwilliam, too. 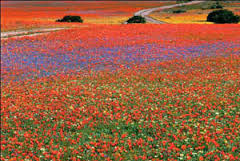 By now most accommodation establishments are fairly full for the flower season. Pick the one of your choice, and if they can't help you with the dates you require, phone the Tourism Office (027 4822024, in Clanwilliam) and they will tell what's available for what date. They keep a list of flower season accommodation availability that is regularly updated. The weather is the obvious factor that will make or ruin flower-finding. If there's no sun, the flowers won't open. I once had a frantic call from prospective guests in Japan. "We come this weekend, just for flowers! Yes? You have room? We come just for weekend! You can help?" "No!" I was aghast. "It's too far to take such a chance for one weekend! Don't come!" Not very adventurous advice, but then, I'm never adventurous with some-one else's time and money. It doesn't have to rain to put the flowers to sleep. Cloud will do it, too. The next thing to watch for is to make sure that the sun is behind you if you want to see the full vista of open flowers. They look at the sun. If you're looking at the sun too, your face is pointing away from, not towards open flowers. Pace yourself according to how far you want to travel in a day. Clanwilliam is in the middle of the extended area, but you know what distance you're comfortable with. You probably won't want to go all the way to Kammieskroon, for instance. The drive, the flower-seeking and the return will probably be too much. The Biedouw Valley is close by. Various routes into the Cederberg, taken slowly, can be magnificent. Daily communication with other flower seekers and info offices is a good idea. I hear guests swopping notes over breakfast, and being greatly helped. 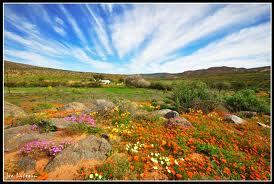 The Clanwilliam Tourism Office develops flower routes as the season progresses. Daily updates are available. I would advise planning flower routes on short notice rather than long forecasts. Daily news is good to go by. The cloud-map is extremely unpredictable. Come with a relaxed attitude. If it's "I will see flowers if it kills me" you won't die if you don't see flowers, but the fun will. And if the illustrious Law of Attraction works, flowers, sun and you will surely find synch, if your soul is filled with grace of colour and contentment, as the fields of flowers are. You find what you are. Enough esoterica. Plan your day and route in respect of your meals. If you have nibbles and drinks with you, you won't need restaurants. If that's okay, you can be more free to change routes. In Clanwilliam, a typical day's weather pattern for good weather works like this: it's heavily misty from early till later because of the town being between the Olifants River and the Jan Dissels River. At about ten to ten thirty the mist lifts and the clear sky opens the way for sunlight. The temperature could be about 20 - 22C. If you stay in the sun, a short-sleeved top can work. Listen to locals, even if their directions seem odd. I once heard people being directed in entirely the wrong direction, so take care, too. But so what? You're on holiday, and life is as short as a flower season, and equally unpredictable. Wear lotion. Speak slowly. And don't pick flowers. That hurts the universe.